What Lessons Can America Learn from Europe? Some issues never seem to get resolved. One would think, for instance, that leftists would be more cautious about pushing for a bigger welfare state given the fiscal crisis in Europe. But we have folks like Bernie Sanders openly arguing we should be more like nations such as Denmark and Sweden. To give some credit to the Vermont Senator, he’s at least smart enough to pick Scandinavian nations that compensate for the damaging impact of high taxes and excessive spending by being very market-oriented in all other respects. Though I suspect he’d be horrified to know that he’s basically endorsing a laissez-faire approach to policies such as trade and regulation. But let’s set aside the quirky candidacy of Bernie Sanders and focus on whether the United States, as a general rule, should be more like Europe. To be sure, this is a very imprecise way to look at the issue since “Europe” includes very market-oriented countries such as Switzerland and the United Kingdom (both of which rank above the United States for overall economic freedom) as well as very statist nations such as Italy, France, and Greece. But if you take the average of European nations, there’s no question that the continent would be further to the left than America on the statism spectrum. So we should be able to learn some lessons by making general comparisons. Let’s go to the other side of the world to get some insight on this issue. Oliver Hartwich is an economist with the New Zealand Initiative, and he looks at the negative consequences of the welfare state in his new publication, Why Europe Failed. He starts by sharing the grim data on how the burden of government spending has increased. 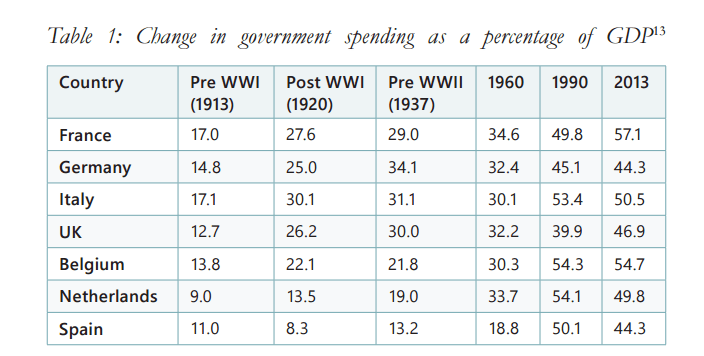 Government spending as a percentage of GDP increased dramatically across Europe all through the 20th century (Table 1). …Since the immediate post-World War II and reconstruction era, government spending has increased to unprecedented levels. The most extreme case is France where the state now accounts for well over half of the economy. …These spending rises have not been driven by the core areas of government spending of law and order, defence and certain public goods. …these European countries spent almost 30% of GDP on welfare alone, which is more than the total of government spending before World War II. 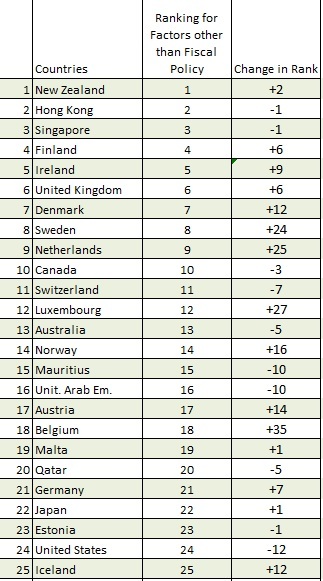 And here’s the Table he referenced. Very similar to the data I shared back in 2013 for the simple reason that we’re both citing the superb work of Vito Tanzi. Oliver adds some analysis, noting that Europe’s voters have sold themselves into dependency. Bread and circuses – or panem et circenses in the Latin original – were the means of bribing the masses in ancient Rome. Modern Europe is witnessing a similar phenomenon. …Unfortunately, it is often overlooked that government can only bribe the people with their own money. …Buying European citizens’ loyalty for their mixed economy welfare states has effectively enslaved them. He then shares lessons for New Zealand, but they’re also lessons for the United States. …we have to make sure we do not repeat Europe’s mistakes. …be watchful of the rise of the welfare state. In Europe, the welfare state was a means of buying political power. Of course, the bribed electorate always paid for its own bribes. However, the arrangement worked for as long as new spending commitments could be financed through higher taxes, more debt, or indeed a combination of both. As government spending has now reached around 50% of GDP, and as the debt load stands at worrying levels, the European welfare state model has reached its limits. … we have the luxury of being three or four decades behind Europe’s demography curve. But this does not have to mean that we will be experiencing Europe’s problems 30 or 40 years later. It should mean that we have 30 or 40 years of finding ways to prevent a European replay by finding different answers to the challenges facing Europe today. Here’s a short video of Hartwich discussing his work and its implications. Now let’s look at another source of information. And we’ll actually deal with an argument being peddled by Bernie Sanders. In an article for the Mises Institute, Ryan McMaken looks at the assertion that the United States has the highest poverty rate in the developed world. Bernie Sanders claimed that the United States has the highest rate of childhood poverty. …UNICEF…is probably the source of Sanders’s factoid… Sanders probably doesn’t even know what he means by “major country”. Though maybe the OECD is the source of Senator Sanders’ data. After all, as Ryan explains, some organizations are completely dishonest in that their supposed poverty data actually measures income distribution rather than poverty. We get much more insight, though, once we have a look at what UNICEF means by “poverty rate.” In this case, UNICEF (and many other organizations) measure the poverty rate as a percentage of the national median household income. …The problem here, of course, is that…the median income in the US is much higher than the median income in much of Europe. So, even someone who earns under 60% of the median income in the US will, in many cases, have higher income than someone who earns the median income in, say, Portugal. 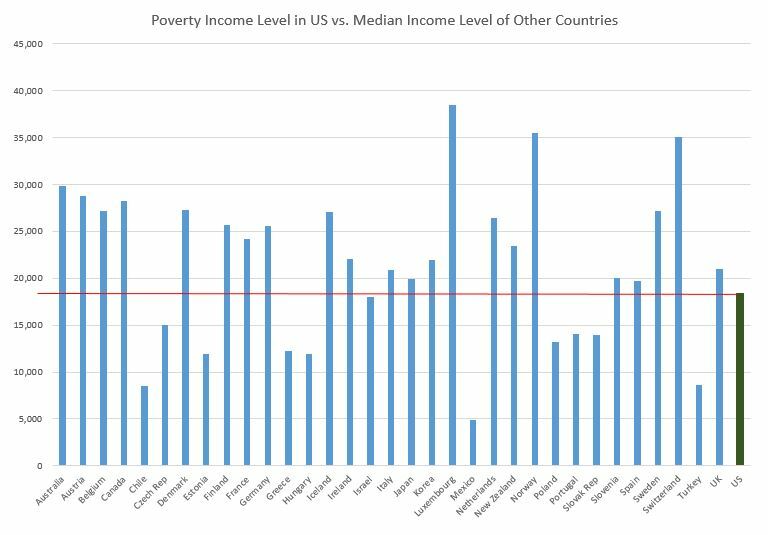 McMaken then crunches the data to see what actually happens if you compare the poverty level of income in the United States to overall income in other industrialized nations. So what’s the bottom line from this data? The answer is that it’s better to be a “poor” person in the United States than an average person in many European nations. …a person at 60% of median income in the US still has a larger income than the median household in Chile, Czech Rep., Greece, Hungary, Portugal, and several others. And the poverty income in the US is very close to matching the median income in Italy, Japan, Spain, and the UK. In other words, Bernie Sanders is wrong, UNICEF is wrong, and the OECD is wrong. Poverty in the United States is not high. Indeed, experts who have looked at actual measures of deprivation have concluded that the real poverty rate in the United States is relatively low. Even when compared with the more market-oriented countries in Northern Europe. Last but not least, let’s look at one more Europe-America comparison, just in case the aforementioned data wasn’t sufficiently compelling. 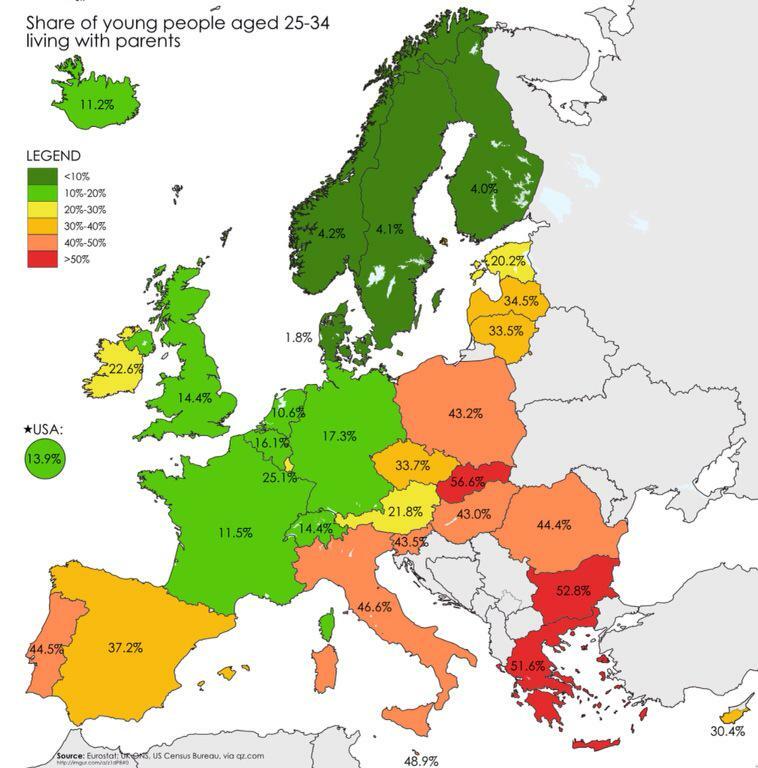 Check out this map showing how many young adults still live with their parents (h/t: Paul Kirby). As pointed out above, Europe is not monolithic. The Northern European economies lean more toward free markets than the Southern European economies, so this map presumably captures some of that difference (though I imagine culture plays a role as well). But for purposes of today’s analysis, our message is more basic. Simply stated, the United States should not be more like Europe. Instead, we should seek to be more like Hong Kong and Singapore. Assuming, of course, that the goal is to have policies that promote prosperity. It is really absurd to condense this article by saying ” The poor in America should not complain, if they lived in Europe with their present income, regardless of wealth, they would be middle class! V-Max, Germany has accepted many Syrians as new inhabitants, as has Turkey and other European country’s. Germany’s government realizes these new immigrants will probably stay with the situation in their home country’s being as bad as it is and will be. Germany’s government has set up a different pay-scale and classification for most of these immigrants to protect the present German workforce and their benefits. Call it socialism if you like it will work better then the U.S. present policy and law protecting employers who hire illegals at slave wages with no benefits. Shawn Martin is right in that the graph used in this article shows that a higher income in terms of dollars is needed in the U.S. to sustain the same level of wealth or basic living standard then in Europe or the other country’s, and most European country’s have universal insurance, so bankruptcy because of medical bills are near impossible, while here in the State’s a majority of individual bankruptcy has medical debts as the major reason for filling for bankruptcy. Also, the level of transportation for individuals is much better in Europe, many middle class people get by without a car as commuter trains, water taxi’s and buses are supported by the (socialistic, sarcasm) government. In the State’s very few of the poor have public transportation available and must depend on a car, another added cost of living in rural area’s or having a odd hours part-time job. Many in the State’s must depend on weak short schedules for public transportation, as we are a automobile culture. I could go on about our sovereign currency as opposed to the Euro, which is backed by Private Banks and not the governments of Europe, quite the opposite of the U.S. which backs are currency(dollars) with the full trust of the Federal Government according to the Constitution. how is the migrant thing working out for you? Cost of goods bs services lower in Europe? ! The poverty level is set to indicate the bare level of survival in a country. Who cares if our poverty level is higher in income than several European countries’ median income. The cost of the goods and services in those European countries may be lower. A higher poverty rate in the OECD is still something that the U.S. has. In the United States, poverty for a family of four is around $22,000 per year. For reference, Median household income in the world is around $9,800 per year. But at a new American structural and now secular growth rate of 2%, ie HALF the average world rate of 4%, this gap is now closing fast, compounding the United States into the middle income group at a fast, compounding, and unforgiving 2% per year. The flatter effort-reward policies of Sanders and HopNChange will only accelerate this decline. For reference, Europe is compounding into the world average at an even faster rate of 3% per year. At this rate, by mid-century, France will be a middle income country. Sweeden may last until 2070. As a side note, my prediction is that we won’t even get there. Europe will implode way before that. This quick low-growth decline is not a path to emulate. It is s pity indeed as the U.S. could grow again faster than the world average, currently 4%. But not with more socialism. That is asinine. By shrinking the size of government to below 20%, the level that once allowed “a rogue” USA to grow at twice the world average. America’s current prosperity the a result of a smaller state. A smaller government that enabled America to grow at almost twice the average world growth rate for more than a century. Now at half the average world growth rate, it will not take long to squander the accumulated advantage. These are the party years of decline. These are the years of “free stuff”. America’s ideological convergence to the rest of the world has the predictable and inevitable consequence: convergence to average per capita prosperity. The decline is unfolding. These are the years we are now living through.